This is a book that speaks to educational professionals, parents, healthcare providers and a general readership about how sensory integration difficulties, including autism, interfere with learning. The book provides practical, hands-on applications that teachers, aides, parents, therapists and family members can use to help young people with these difficulties learn and engage socially. The book is based, in part, on the clinical studies the author has conducted as well as her experience. There are numerous case studies in the book. The manuscript has been reviewed in its entirety by experts in the field. New Frontiers in Sensory Integration focuses on providing support for children with autism and sensory needs though the resources contained here can be used effectively for all children. The causes behind what we call Sensory Processing Disorders remain unknown despite ongoing research. This is because causation is likely a mixed bag of genetic, epigenetic, environmental, neurodevelopmental and cultural factors. The important question that this book addresses is what we as parents, therapists, educators and care-providers can do about this growing epidemic in an empowered and sustainable way, no matter the causation. Reviews: This is a wonderful book with a fresh take on the symptoms and treatment of sensory disorders. Dr. Mines’ Tara Approach to treatment has an insightful blend of body-based therapy, child-directed sensibility and intuitive sensitivity. Parents and therapists alike will especially find the self-regulation techniques helpful in day-to-day practices. Dr. Mines’ TARA Approach interventions, her easy to understand overview of the diagnostic process and her basic sensory descriptions are vital for advocates of children with developmental needs, including parents. This is a book with real stories that provides a personal as well as an intellectual guide. It is a must read for anyone serving people with sensory needs and autism. 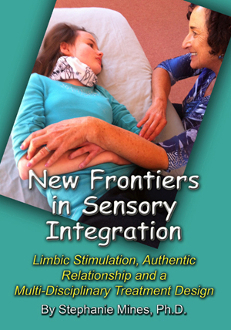 ~ Dore E. Frances, Ph.D.
Dr. Mines condenses an enormous amount of vital information regarding the integration of several different systems and theories of practice in New Frontiers in Sensory Integration. Dr. Mines is able to capture the eloquent stories of several patients who have benefited from her approach. The reader gathers practical applications of applied touch, story-telling, family structuring, and how to access external resources to benefit those patients who experience sensory processing disorders. This book provides useful information for both parents and practitioners as they interface with children of all ages. New Frontiers in Sensory Integration will prove to be a valuable resource for my practice as a physician and mother. Dr. Stephanie Mines is a psychologist whose unique understanding comes from her academic research as well as her extensive work in the field. Her stories of personal transformation have led many listeners to become deeply committed to the healing journey. Dr. Mines understands shock from every conceivable perspective. She has investigated it as a survivor, a professional, a healthcare provider, and as a trainer of staffs of institutions and agencies. Her blend of Western and Eastern modalities offers the best of both paradigms. She is devoted to ending the lineage of shock and trauma for individuals and the world. Dr. Mines is the Program Director of the DOM Project, a non-profit organization dedicated to providing alternative health options for a broad spectrum of populations. As Director, she is responsible for disseminating information to communities in need, especially people suffering from illness that results from shock and trauma, survivors of domestic violence, families and children, and people living with neurodiversity including autism and other sensory integration challenges. Dr. Mines’ previous book, We Are All in Shock: How Overwhelming Experiences Shatter You and What You Can Do About It, (New Page Books, 2003), presents a comprehensive application of the healing system she has developed. Presently, she is working on a net book concerning the impact of war from the perspective of families and children who experience the effects of a returning veteran with PTSD or combat shock. The titles are still in process.